Welcome to Cloudeight InfoAve Premium issue #805. Thank you very much for subscribing and for being a part of our Cloudeight family. We appreciate your friendship and support very much! Our Spring Pay What You Like Sale is Back! Spring is right around the corner and we're celebrating by bringing back one of our most popular sales ever! We're giving you the option to choose what you pay for some of our most poplar products & services. Cloudeight Direct Computer Care Season Ticket - Computer Care for one full year. Don't need anything? Please help us with a donation. Our Spring Sale won't last as long as spring, so don't miss out. Help yourself and help us too. Get all the details here and get a great deal on a great product or service. Your purchase supports our small business and helps up keep on helping you. Thank you so much! Darcy and TC , you guys have been the best thing that ever happened to me concerning my computer repairs. And thanks to you both my computer repairs have been few and far between because what you do, you do it so well. You are why I can even afford to have a computer. Because I could not afford to take it in for expensive fixes to my computer messes. The best part, I don’t even have to take it in. So convenient and you do amazing work. We love you, I cannot imagine computering without you. Please never grow old, because I need you! We have an elderly neighbor who was just about to begin paying these scammers when he explained the problem to me. It was an easy fix–with Darcy’s usual helpfulness–and it just made me wish that they all read your newsletters. My Mom, who just turned 90, introduced me to Cloudeight many years ago and the best testimonial that I can give is that you have kept our computers problem free in all those years. Cloudeight would have new corporate headquarters, should we ever win the Lotto! Keep fighting the good fight. A big Cloudeight "Thank you!" to Judy, Frank, Brenda, Don and everyone who took time out to write to us. We appreciate your kind words and your support very much! EB & TC. Pick you own price on our most popular products and services. Save on Season Tickets, Cloudeight Direct Computer Care Repair Keys, Thunderbird installation, and Emsisoft with Installation. I am having a problem downloading a game. An error message keeps popping up which says: NSIS Error - Error Launching installer. It happens on every game site I try to download a game on. I got a new computer a couple of days ago and that is when the problem started. I appreciate all the help you have given me over the years and you are the only ones i trust with any computer issues. I hope you can help me with this problem. Thank you. Hi Nadine. It sounds like you have downloaded a corrupted installer. Delete whatever installer you downloaded, and then reset your browser. After resetting your browser, restart your computer. You should be able to download your files again. It's important that your restart your computer after deleting any installers and resetting the browsers, otherwise this fix won't work. Learn how to reset Chrome here. Learn how to reset Firefox here. Learn how to reset Edge here. Learn how to reset Internet Explorer here. Nadine wrote back: "Thank you so much for your help. The tip you gave me about a corrupted installer and how to fix it worked perfectly. I really appreciate your help. Thanks again! Nadine W."
Hi Roger. A couple of years ago, I was having problems with LastPass in Chrome. But I was able to easily fix it by completely removing LastPass, shutting down Chrome and then restarting my computer. After I restarted, instead of going to the LastPass site to install the universal version of LastPass or the version for Chrome, I restarted Chrome, went to the Chrome Web Store and downloaded and installed the version of LastPass made for Chrome from there. It worked beautifully and here 2 years later it's still working without a hitch. If you follow our advice and re-install LastPass, all you will need to do is sign-in to LastPass with your master password, and you'll be back in business! Hope this works for you, Roger. Roger wrote back: "Thanks TC. It worked like a charm. It's great to have LastPass working well again. Appreciate your help. Roger"
Hi Elwood. We found numerous problems with TotalAV. First it's not free - it's $39.95 ($19.95 for "entry level" protection) whatever that is - see this page. They do a good job making it look like TotalAV is free but it's not. You can download it free and try it for 30 days. Secondly, it's had 22 complaints filed against with the BBB which you can see here. So, it looks like customer service is poor or non-existent. Emsisoft customers rave about the great support they receive from Emsisoft. And finally, TotalAV is not ranked very highly by independent AV rating sites. Emsisoft is not only a great antivirus - always ranked in the top ten by the independent labs, it's the best antimalware you can have. Emsisoft protects you from the things you're most likely to encounter. It's very rare these days to encounter a virus on the web, but it's very likely you'll encounter malware like browser hijackers, ransomware, PUPs, exploits, bundled software and other malicious software. So, if you're looking to save money, TotalAv won't do that. If you're looking for better protection, TotalAv won't do that either. And if you're looking for great customer support forget it - TotalAv seems to have a poor reputation. Emsisoft is less expensive, offers better protection, and has great customer support. So, we don't see a single advantage in using TotalAV - all we see are negatives. Hi Keith. Thanks so much. We're not familiar with the Australian government's policies on blocking peer-to-peer sites. Like any other technology P2P can be misused and a lot of illegal files are "shared" via P2P. For example copyrighted movies and music. It may not only be a copyright violation, movies can be huge files and use up a lot of bandwidth. We are not saying most people use P2P for sharing movies and music. If all you want to do is download / share files via P2P, a browser-based VPN might be the easiest and best solution for you. Browser-based VPNs only work with the browser on which they're installed. In a case such as yours, you might want to install a VPN that is a browser extension that you can turn on and off and use it only when you need to use P2P. This would be much easier and better using a VPN that works on a operating system and network level. One problem with routing all traffic through a VPN is that some Web mail, credit card sites, banking sites, and other financial sites, use your IP address to identify you to add an additional layer of protection for your account. If all your traffic is routed through a VPN, your IP address will change, and maybe often, and you may appear to be from the other countries such as the USA, New Zealand, Japan, Romania, United Kingdom, etc. 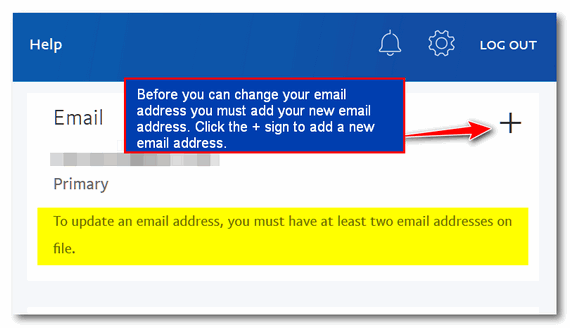 and be unable to log in to Web mail, financial sites, etc. depending on what server you are using with the VPN or which server the VPN chooses. This may cause you problems when logging in to Web mail accounts, banking sites, credit card sites. A couple of free browser-based VPNs that work with Chrome and Firefox are CyberGhost and Windscribe. Both are highly-rated browser-based VPNs that you can turn on and off as needed. Both are installed as Chrome extensions (or Firefox Add-ons), and both are free. However, Windscribe has a 10 GB data limit - above that limit you will to pay for the service. CyberGhost limits he number of servers you can use, which shouldn't be a problem if all you're going to use it for is P2P file sharing. If you have Chrome installed, visit this page to learn more about and/or install CyberGhost VPN for Chrome. For WindScribe visit this page. If you have Firefox installed - open it and visit this page for CyberGhost. Or this page for WindScribe. There are dozens of browser-based VPNs, but CyberGhost and WindScribe seem to be most highly rated. If you're going to be searching for other VPNs, we recommend you avoid any that are based in China or Russia. We hope this helps you, Keith. Hi TC & Darcy. I want to download Recuva but I really don’t want to use CCleaner, or Filehippo etc., I would like to download it from Piriform but can’t find anything that I can download from. Have you any ideas? Bev. Hope this helps you, Bev. Note: For those who are wondering what Recuva is, it's a free program that helps recover deleted files. Bev wrote back: "Hi TC: Thanks so much again for your help. I really appreciate all the help I can get. Bev"
Angie is worried about her email address being "pwned"
Hi Angie. ShareThis is a site sharing service. A lot of sites have "Share This" buttons. 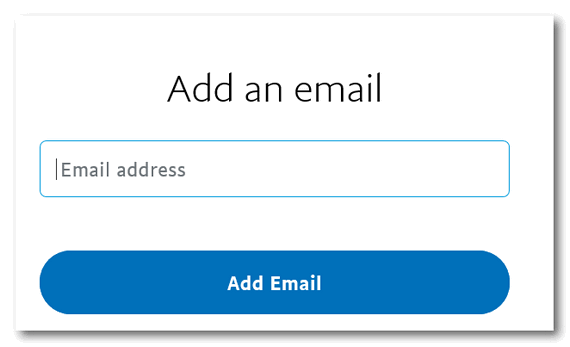 These buttons allow you to share web sites you like via Email, Twitter, Facebook, etc. When you sign up you give them your email address and a name. The ShareThis site was breached but no personal information was stolen. Your email address is not personal information. This is a minor breach and nothing you should worry about. No passwords were stolen, no personal information such as your street address, city, Social Security number, credit card numbers, or phone numbers were involved. Why? Because ShareThis doesn't ask for any personal information beyond a name and email address. Your email address is and has always been vulnerable - spammers have been harvesting and collecting email addresses for decades. I would not worry about a breach at ShareThis. 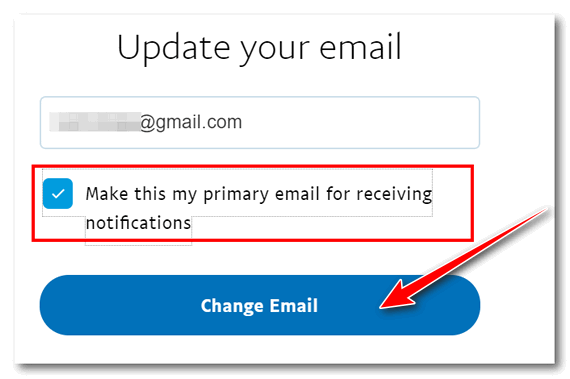 If you're worried about your email address being compromised you don't have much choice but to stop using that email address and use a different one. But that's your choice. If this were MasterCard, your bank, Visa, Amazon, PayPal, or some other site with access to your financial accounts, credit accounts, online shopping accounts, medical records, Social Security number, I'd be concerned and advise you to change all your account passwords. But ShareThis has no personal information of yours - no medical records, credit cards, online shopping accounts, etc. Don't worry about this, there are a lot of more important things to stay focused on. Angie wrote back: "As always, THINK YOU! Great explanation! I will not worry about it. Angie"
Don asks: "What is the difference is between copying a file to another drive and backing up a file to another drive?" What is the difference from backing up a file to another drive or coping a file to another drive? Hi Don. There is technically no difference between copying a file from one place to another and backing up a file. 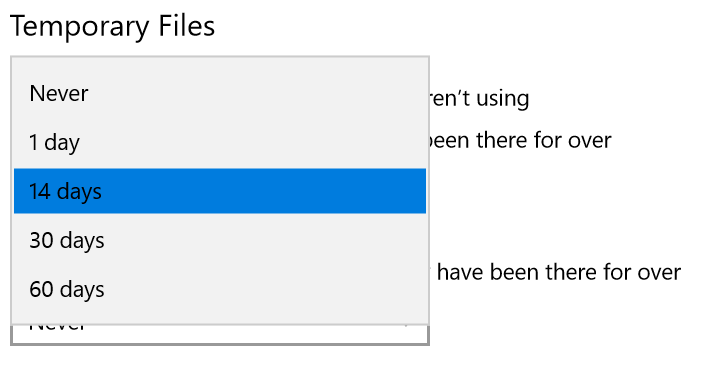 The only other way to add a file to a new location is by moving it. Whether you copy a file to an external drive or USB flash drive or backup a file to an external drive or USB flash drive. the file remains in both locations. 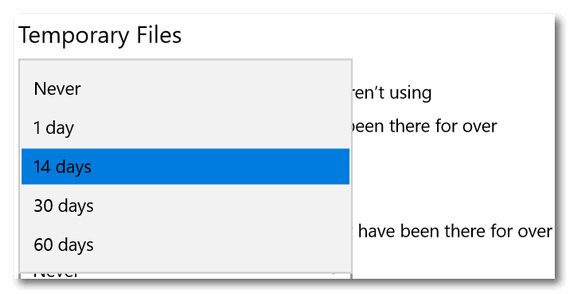 The only other way to change the location of a file is by moving it - and If you move a file it will only be in one location and that would be the location to which you moved it. 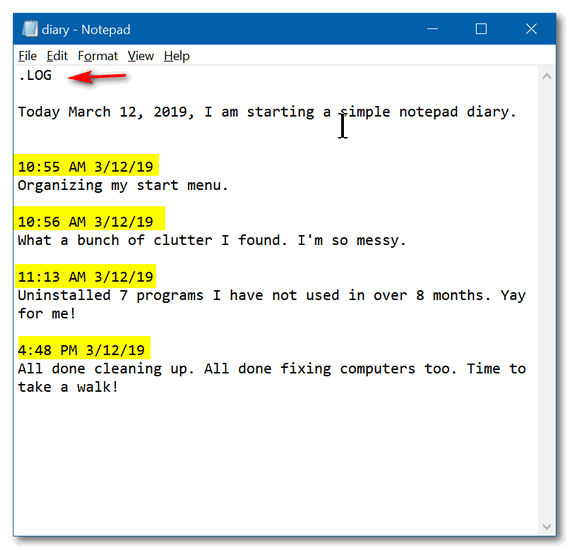 Here's an easy Windows trick you can use to create a diary using nothing but Notepad. 2. On the very first line of your new Notepad type .LOG ... that right, a period first then LOG in uppercase letters. 3. Space down a line or two and type a description (optional). For mine I used "Today, March 12, 2019, I am starting a simple Notepad diary." 4. Save your new Notepad file with a name you'll recognize. Diary would me nice - or MyDiary. 5. Next time you open it the date and time will be automatically added. So all you have to do is type in whatever you want to that date and time. And then save your file. 6. When you open it the next time, the current date and time will be appended automatically so all you have do is add whatever you like to your simple Notepad diary. Above: My simple Notepad diary complete with dates and times. 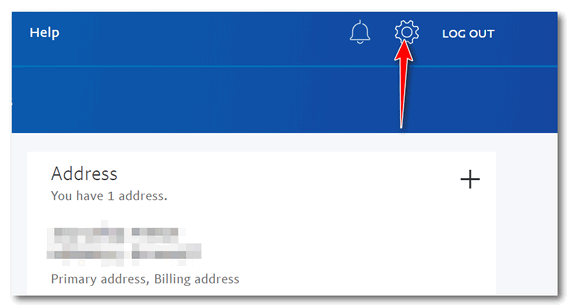 After you’ve made your new address the Primary PayPal address, you can remove your old PayPal email address. "The Disk Cleanup experience (“cleanmgr.exe”) is being deprecated. We’re retaining the Disk Cleanup tool for compatibility reasons. There’s no need to worry since Storage Sense’s functionality is a superset of what the legacy Disk Cleanup provides! The Disk Cleanup Tool has been there for years. Sep 17, 2018..."
Microsoft uses the word “deprecated” loosely. The meaning of deprecate, according to Merriam-Webster is ” (to)…disapprove of, deplore, abhor, find unacceptable, be against, frown on, take a dim view of, look askance at, take exception to, detest, despise, execrate…” A good synonym for the word deprecate in the sense that Microsoft uses that word is “retire”. So, Microsoft is retiring the venerable, old Windows Disk Cleanup in favor of Storage Sense. What does this really mean for you? It means Disk Cleanup may stop working correctly or it may start deleting things it shouldn’t … or it may stop working entirely. It’s time we let Disk Cleanup enjoy its retirement and start using Storage sense to clean up the clutter our on our computers. Use the switch to turn Windows 10 Storage sense ON. 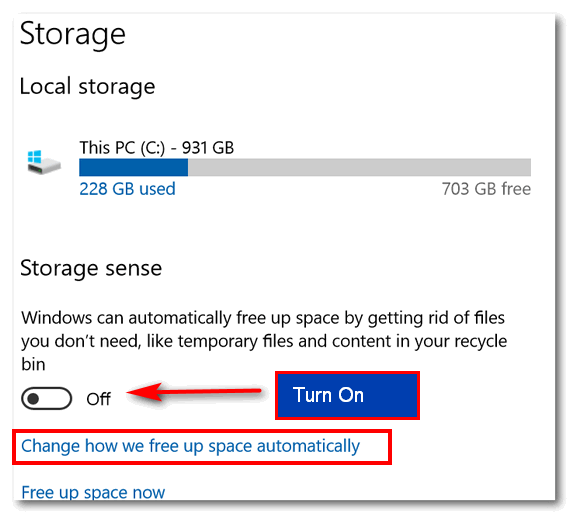 Then click on “Change how we free up space automatically” to customize your Storage sense settings. You’ll see the Windows default Storage Sense settings. 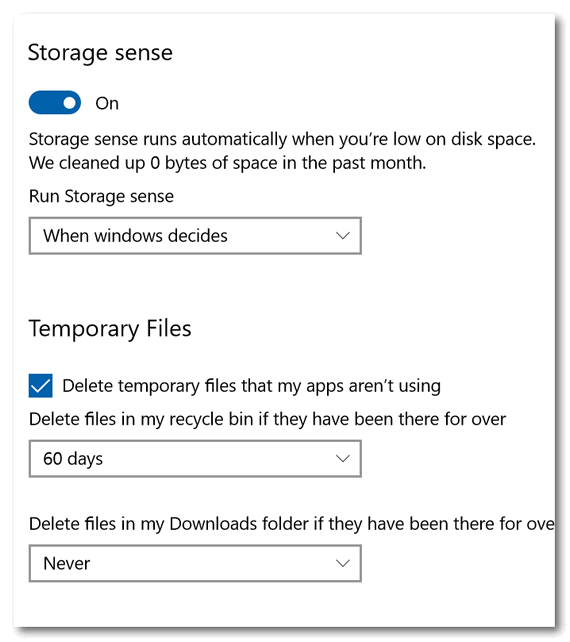 Windows will decide when to run Storage sense and will delete temporary files every 60 days. But you can customize these settings. 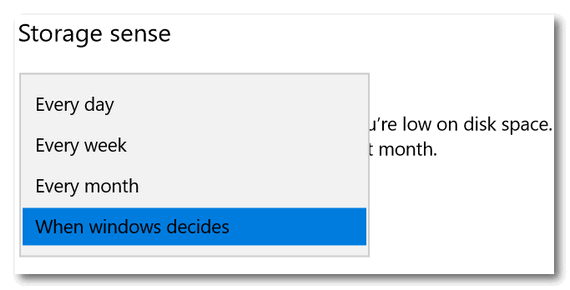 You can choose to run Storage sense, Every day; Every week; Every month; or let Windows decide for you. When you turn Storage sense on, it will, by default be set to automatically delete your temporary files every 60 days, but you can change it to: Never; 1 day; 14 days; 30 days or leave it set to its default – 60 days. You’ll also see an option to delete all files in your Downloads folder. By default this option is set to Never. When I download portable applications – applications that don’t need to be installed, I leave them in my Downloads folder and make a shortcut to them. I do not want Windows to delete anything in my Downloads folder. But if you don’t use portable apps, or you keep your portable apps in another location and all you have in your Downloads folder are program installers for programs you’ve already installed you might want to let Windows clean your Downloads folder. I would suggest you leave it set to “Never” unless you’re sure you have nothing important in your Downloads folder. But if you want Windows to clean it up, you can choose to have Windows clean up your Downloads folder every: 1 day; 14 days, 30 days or 60 days. 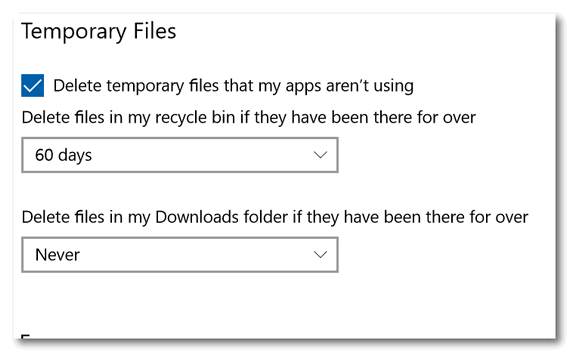 You can also use Storage sense like you used to use Disk Cleanup – you can run it on demand, whenever you want . NOTE: If you select “Delete previous versions of Windows” you will not be able to roll back your Windows version to the previous version of Windows 10. 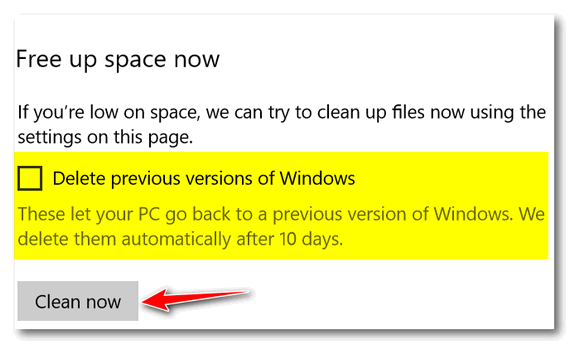 If it’s been more than 10 days since you updated to a new version of Windows, the Windows.old file (the file that lets you roll back to a previous version) should be automatically deleted after 10 days. If you want to learn how to give yourself more than 10 days to go back to a previous version of Windows, read this. Once everything is set the way you want it, click on the “Clean now” button to clean up junk, temp, and other unnecessary files on your computer. I have not used Storage sense or anything else to clean up this computer in a long time, so let’s see what happens when I click “Clean now”. Windows Storage sense cleaned up my computer and freed up 4.46 gigabytes of disk space. Not bad! 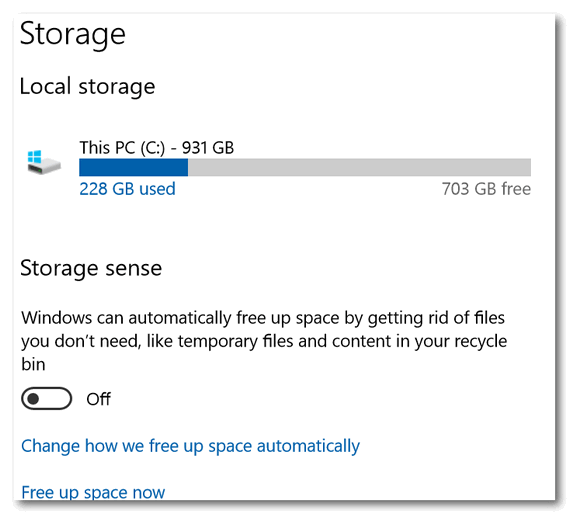 It’s time to stop using Windows Disk Cleanup and start using Storage sense. As time goes by Disk Cleanup may tend to get more and more unreliable. It’s time to move on. 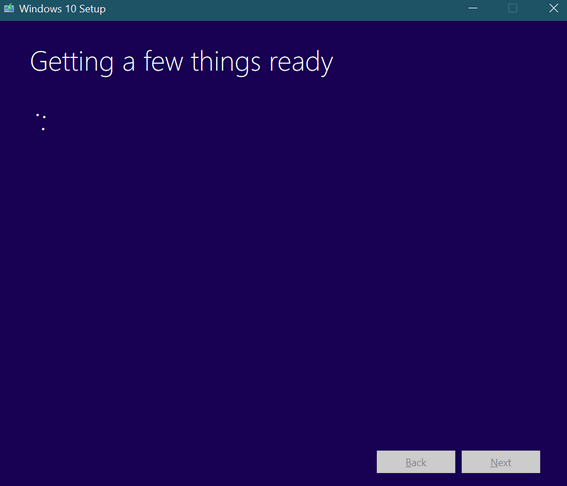 If you’re using Windows 10, you should make a Windows 10 installation DVD or USB right now. It’s easy to do and there are many good reasons why you should. And Microsoft makes it easy to do – at least for now. Who knows what Microsoft will do tomorrow. 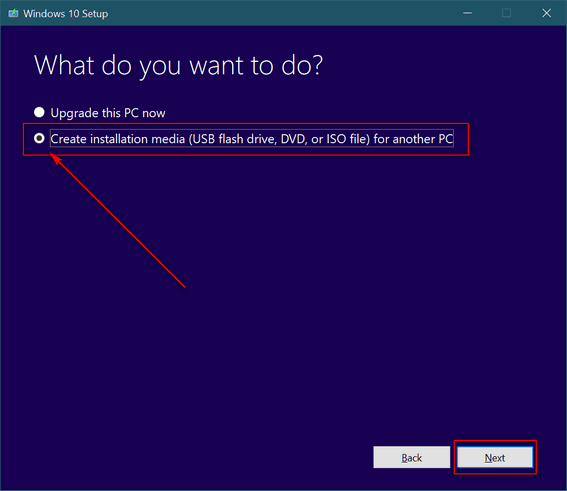 Why do you need a Windows 10 installation DVD or USB? You can access troubleshooting tools. If your PC won’t boot normally you can boot with an installation USB or DVD and access troubleshooting and other tools. 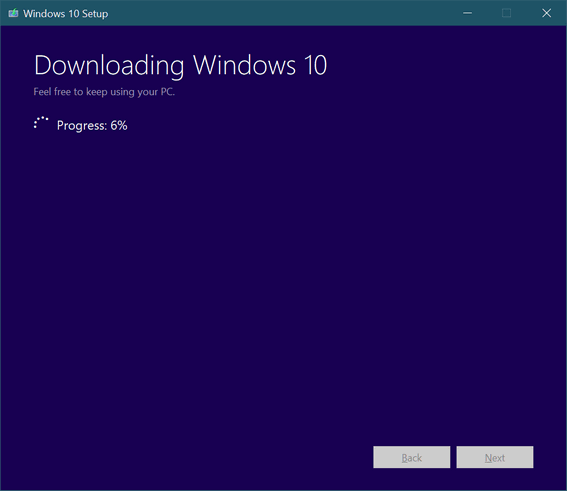 You can use your Windows 10 installation USB or DVD to do a repair installation of Windows 10 which, if completed successfully preserves all you personal files, settings, and all your installed programs. First things first. 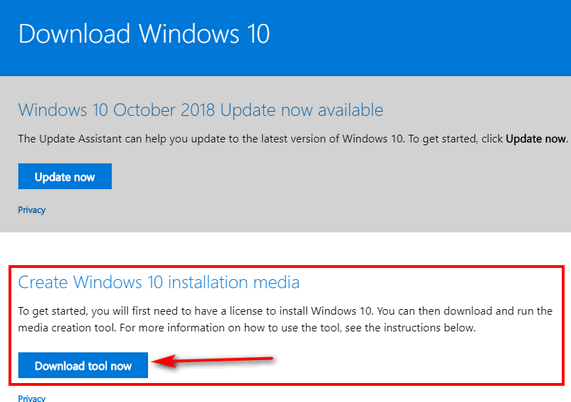 You’ll need to go to this Microsoft page, scroll down past “Update now” and go to the section called “Create Windows 10 installation media”. See? Now the important stuff. Since you want to make an installation USB or DVD, make sure the you tick the circle next to “Create installation media (USB flash drive, DVD, or ISO file) for another PC”. Then click “Next”. If you’re creating installation media for the same PC you’re using now, leave the box ticked next to “Use the recommended options for this PC ” ticked. Most of you will want to leave this box ticked click “Next”. 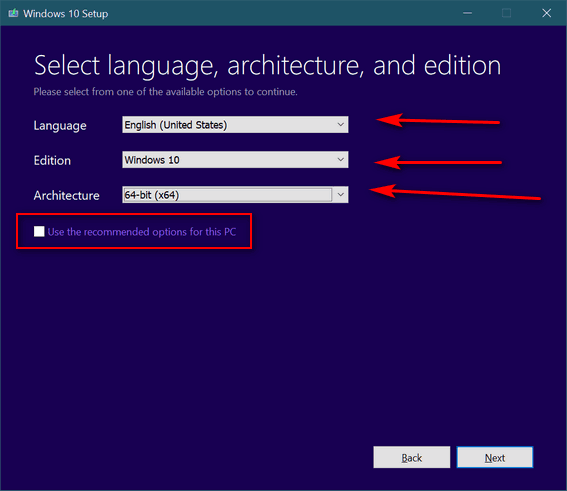 If you’re creating installation media for a different PC, untick the box next to “Use the recommended options for this PC “, then select the language, edition of Windows 10 (Windows 10, Windows 10 Pro, etc.) and the architecture (32-bit, 64-bit) of the PC for which you’re creating the installation media. Next: Choose which type of installation media you want to create. Choose USB if you have an 8GB (or larger)USB Flash Drive. A new, never-used flash drive is best, but you can use one you’ve used before, but keep in mind whatever data is on the flash drive will be erased. 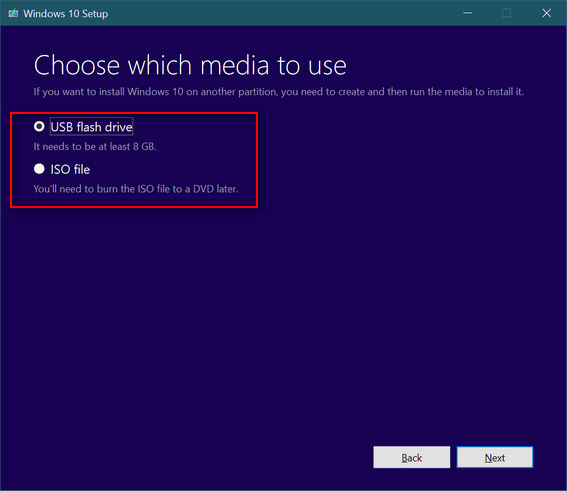 Choose ISO if you want to create a Windows 10 installation DVD. You can burn the ISO file to DVD later. After you’ve made your choice, click “Next”. After you click next, go make some coffee and relax. Windows 10 media file (ISO or USB) will take a while to download as it’s around 3.4 GB in size. For this article I chose to download the ISO file so I can burn a Windows 10 Installation DVD later. But either way you’re still going to be downloading over 3 GB of data. We suggest you tick the box to verify the disk after burning. And whether you choose the Windows 10 USB flash drive installation media or the Windows 10 ISO and made a Windows 10 installation disk, make sure you label it so you know what it is – and keep it in a safe place. You never know when you might need it. Our site pick this week is literally a treasure chest of tools - a toolbox extraordinaire. There are so many tools on Pine Tool we're not even going to try to list them all. What more can we say? If looking at the tools above does not make your fingers twitch to click and visit Pine Tools, there's nothing more we can do! If you're looking for one great site where you can find dozens and dozens of online tools that can help you do just about anything you need or want to do, then take our advice and visit our latest Cloudeight Site Pick - Pine Tools. It really is one amazing site! We’ve been doing computer repair work since 2011. In the past eight years, we have worked on thousands of computers and we’ve seen just about everything. All too frequently we’ve seen computer repair services taking advantage of senior citizens. Far too often we have learned of people paying hundreds of dollars for unnecessary computer work that didn’t repair anything. Far too many times we have helped people who were frightened by some computer repair crook who told them that their computer was corrupted, infected or “hacked”. We see now, more than ever, companies that most consider legitimate preying on and scaring folks with the “dark web” threat, knowing full well that most people don’t know much at all about the dark web. Nothing frightens people more than the unknown. We’ve watched dishonest companies prosper; we’ve seen crooks become wealthy. We’ve seen people scared into spending hundreds of dollars unnecessarily by one tech support scam or another. When we read a recent article in the “USAToday” newspaper, we were not shocked. Here’s part of that article – and it’s so disturbing to us because, in our work, we see this going on every day. $356,000 to protect your computer? WASHINGTON – One man, alarmed at the thought that hackers might attack his computer, shelled out $14,990 to a company promising a “fix” that would keep it safe. Eight months later, the 68-year-old from Hawaii mailed the same company a check for $24,999 more. And he kept paying. All told, the unnamed man, who suffers from dementia, sent about $356,000 in checks and wire transfers, unaware that the computer security alert was part of a network of elaborate scams that the government says cost the nation’s elderly and infirm hundreds of millions of dollars over the past year alone. The case is part of a heartbreaking archive of court documents filed in just the past year, charging more than 200 suspects with trying to swindle 2 million Americans, most of them elderly. Federal authorities said the illicit operations, some based in the United States and others scattered across the globe, looted seniors of nearly $1 billion. The charges brought in the past 12 months, the second such enforcement campaign in as many years, represents the largest of the federal sweeps against elder fraud. Read the entire USAToday article here. We see this kind of thing all the time. Just in the past week, we did computer repair work for several people who were told their computers were corrupted or infected. These folks were offered “repairs” costing hundreds of dollars. Many times the cost of the repair was more than the cost of a new computer – and sometimes much more than a new computer. Read the rest of this rant here. Windows Safe Mode - What is it? Safe Mode has been a part of Windows since Windows 95. The basic concept of "Safe Mode" is to allow a user to access Windows without loading any unnecessary drivers or software. Because Safe Mode only allows basic drivers to load you might be able to boot your computer into Safe Mode when your computer will not boot normally. Windows safe mode provides you with a basic graphics driver (enough to display the user interface), access to your drives and windows configuration, System Restore and very little else. Safe Mode is best thing to try if you are experiencing problems booting your system or if running certain software causes issues with your PC. Using safe mode can let you determine if the problems you are experiencing are hardware malfunctions or software issues and even allow you to use System Restore to go back in time to a date when your computer was working properly. Unlike previous versions of Windows, you cannot boot into Windows 10 Safe Mode by restarting your computer and repeatedly tapping the F8 key. 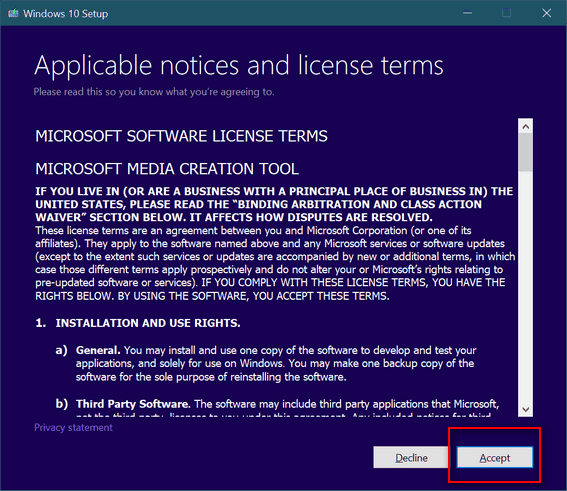 For learn one way you can boot in to Safe Mode in Windows 10, read our tutorial here. For another way, see this page.